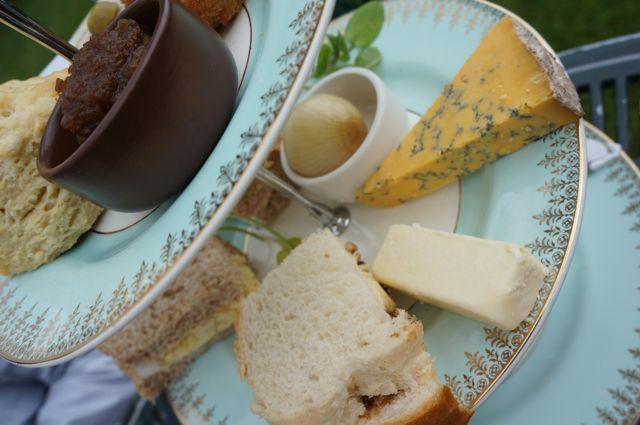 I recently blogged about the “Gentleman’s Tea”, which is is growing in popularity across the UK. 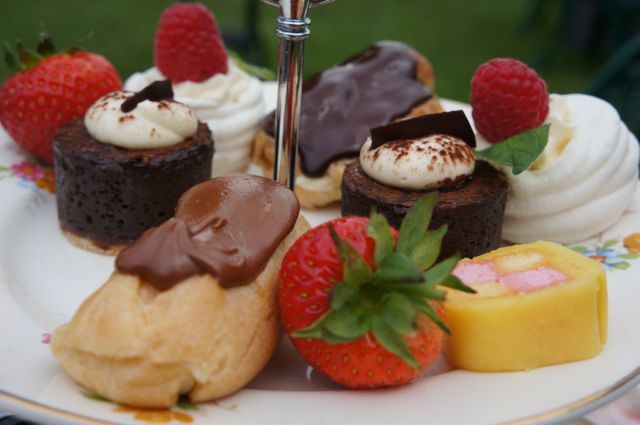 This is an afternoon tea in keeping with an all “British” theme to proceedings, one of which more and more hotels and afternoon tea venues are offering “manlier”afternoon tea tiers to appeal to the gents, as well as the ladies. 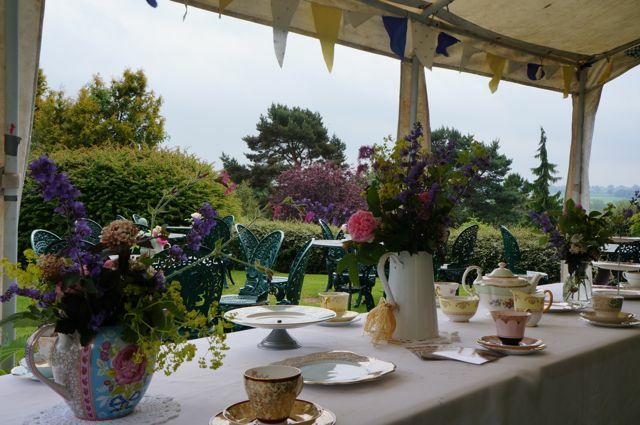 After an invitation to join Julia and the team at Dorothy Clive Garden for #NationalCreamTeaDay to speak about afternoon tea etiquette to celebrate this exciting day, I was also invited to enjoy their very own version of the “Gentleman’s Tea” whilst visiting. Well, who was I turn this down? 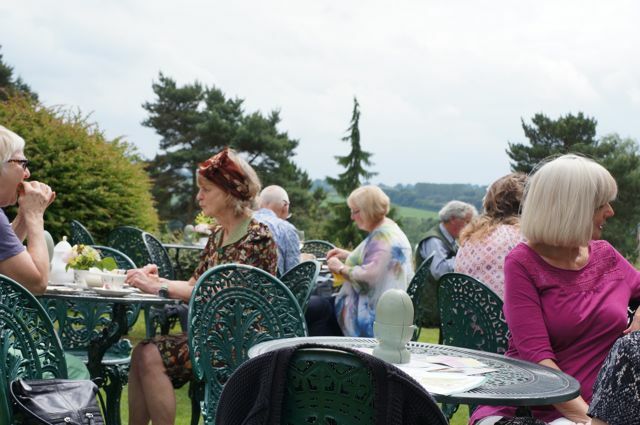 I was joined by my mum, Lynn Hill from The Clandestine Cake Club and my furry canine friend for a sun-drenched afternoon tea within our stunning garden surroundings. The Dorothy Clive Garden is set amidst beautiful rolling countryside between the borders of Staffordshire, Cheshire and Shropshire, very close to Nantwich. This 12 acre garden was initially conceived by Colonel Harry Clive for the love for his wife (Dorothy) in 1940 and is a much-loved destination to this day for people locally as well as visitors from further afield. There is an edible garden and a waterfall featured within these extensive gardens, plenty of nooks and crannies to explore alone or as a family. 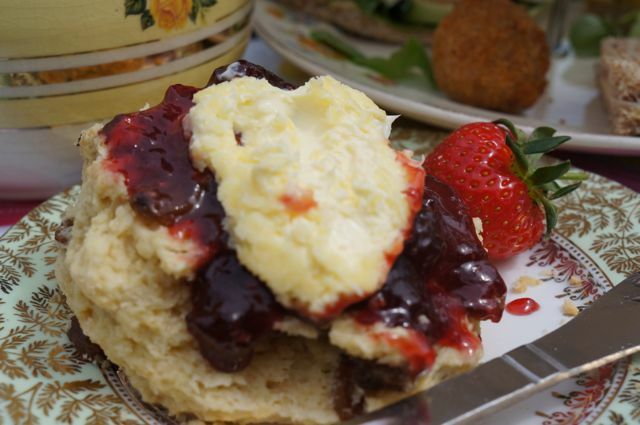 There is a cute little tearoom and gift shop here, boasting the most beautiful tearoom lawn to enjoy an alfresco treat on a glorious sunny day – it’s the perfect setting for a cream tea. 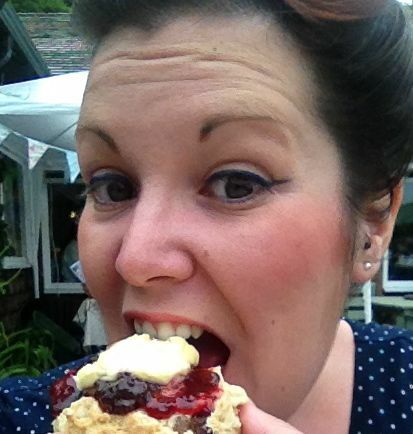 It is open from 11am to 5pm daily throughout the summer season and you can enjoy a full lunch, including sandwiches, soups, quiches and jacket potatoes or a cream tea with homemade scones made freshly on the premises. You can also choose to sample a plate of two Staffordshire oatcakes with various fillings, should you fancy trying a local dish – I’ve had these before, almost like flat pancakes and they are delicious if you fancy trying something a little more unusual whilst visiting. 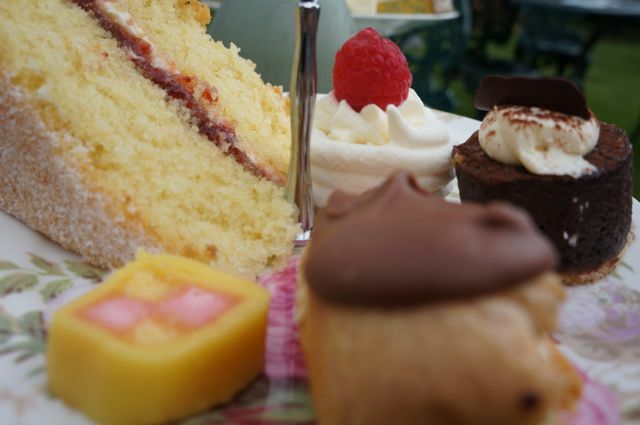 If you are craving an afternoon tea, there are plenty of choices, including a simple cream tea, an afternoon tea tier with finger sandwiches, fruit scones with jam & Roddas clotted cream and a selection of miniature cakes. You could add a glass of refreshing Prosecco for a “champagne tea” or as I did, opt for the more rustic version, ordering the Gentleman’s Tea. This tier offers a mini Cheddar scone, scotch egg, pickled onion, a slice of pork pie, three counties cheese and chutneys, plus homemade cakes and scones – it was all delicious, although I’m not a huge fan of cheese, I did enjoy the Wensleydale on offer, not too strong for me so I enjoyed this wedge of cheese. The team were also trailing some cute mini cakes for this event, as usually it would be a big wedge of cake, so we got to nibble on little pavlovas with fresh cream, gooey chocolate tortes, fresh cream eclairs and a teeny Battenburg, so perfectly cute for a dolls house! You can also choose between Lymestone Brewery real ale, a Gin and Tonic or Whisky and Soda if you prefer some harder stuff with your food. We opted for tea, enjoying the Jasmine tea, Rose infused tea and English Breakfast between us, they were all fantastic loose leaf selections, complete with real silver tea strainers. The china for this event was vintage, beautiful pieces laid out by Pollyanna Vintage China for this particular day, but usually it would be served on white bone china. 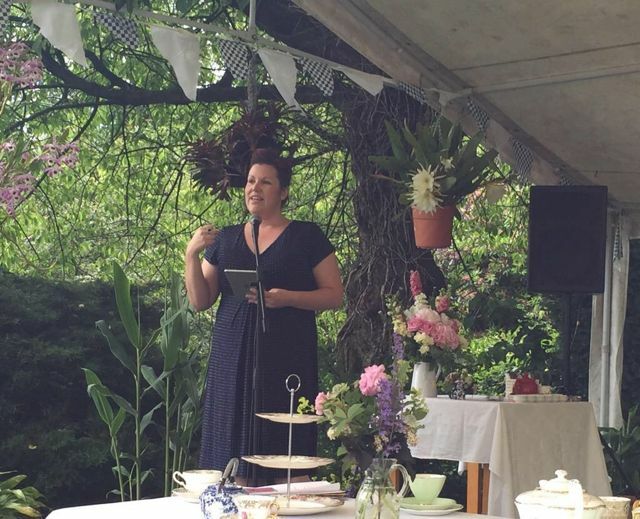 In between nibbling this fantastic afternoon tea, I enjoyed listening to my fellow guest speakers, learning tips on tea and its’ history from Gemma at The Tea Drop and how to match different types of Prosecco to our afternoon tea with Julia at Just Perfect Wines. I also had my hair done up in a superb vintage “up do” and I can’t thank Melissa at “Hair Styling At Home” and Julia for arranging for this to be done for my visit, I was thrilled skinny with my new style. I didn’t take it out to the next day, I was secretly hoping it would last the weekend, but I couldn’t quite fix it after a night rolling around on it, a real shame. 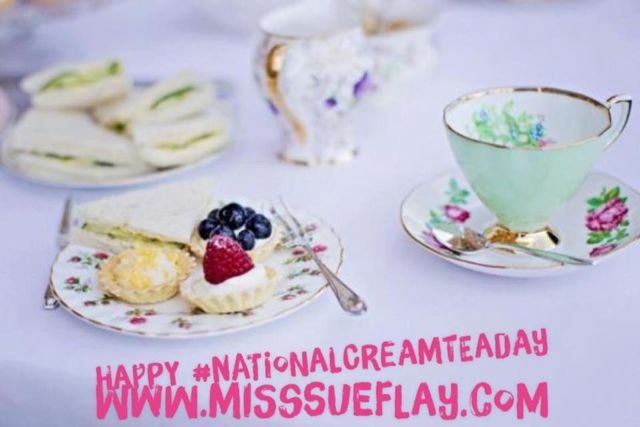 It was a fantastic way to celebrate our mutually favourite mealtime, great company and a great event, where we celebrated the fact that #NationalCreamTeaDay was trending on Twitter throughout the day, it was great news indeed! The Dorothy Clive Garden is dog friendly, so it was the perfect place to bring my pup for a day trip, he loved every minute of his visit, just as much as I did. You can see my full Facebook photo album here. 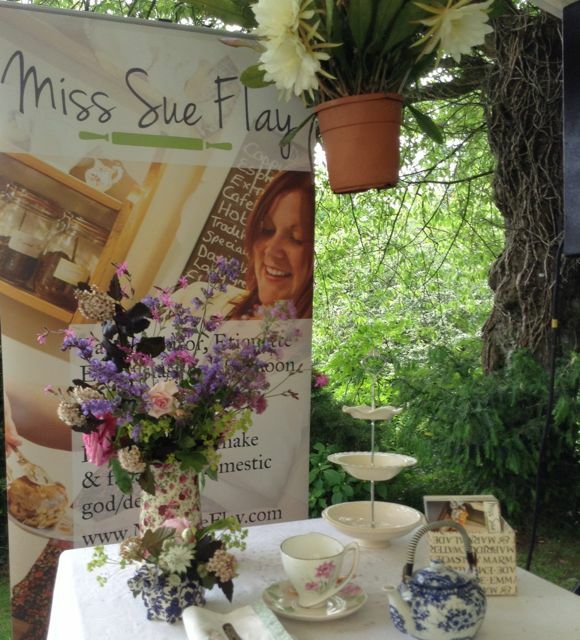 If you fancy your very own lesson with Miss Sue Flay, you can book me for an afternoon tea etiquette workshop/talk here. Please note – This visit was complimentary following an invitation to take part in the event on the day of my visit. I am in no means obliged to blog or write about their offerings, but I simply choose to share with my readers, should I enjoy the experience. The service team that work on the day or duration of my visit are not aware of my reasons for visiting, to enable a fair review.